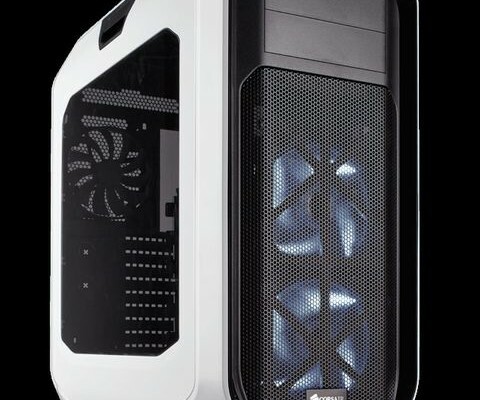 Today, we tested came very interesting computer case Corsair 780T. It is the flagship Graphite in times of minimalism proudly belongs to the category Full-Tower. Let’s find out what opportunities are expanding manufacturer has placed in the 780T.Hopefully, it will please us not only for its size but also high functionality. 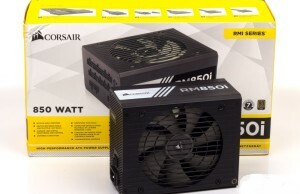 Corsair Graphite Series 780T is available in quite a bulk package, but given the size of the case study is called the standard package. Inside the package, as always, the case was fixed with two foam holders, additional case was “wrapped” in a black rag cover. Incidentally, this housing very well managed with a little water attacks during transportation. On the sides of the box, it can be clearly seen what is inside, there is a further block diagram of each part of the body, so a reliable and informative package okay. Inside, apart from the body found a small manual, a few ties and various bolts designed for each stage of assembly. All of them are packaged in separate bags. 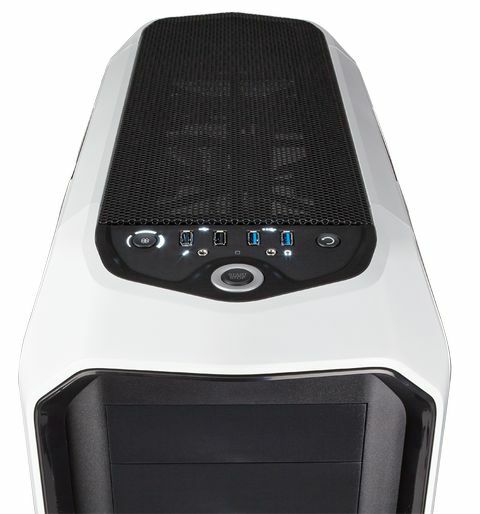 Corsair 780T applies to the form factor Full-Tower, its total dimensions are 288h602h637 millimeters. The mass of the body is located in the 11,3kg that is not enough. 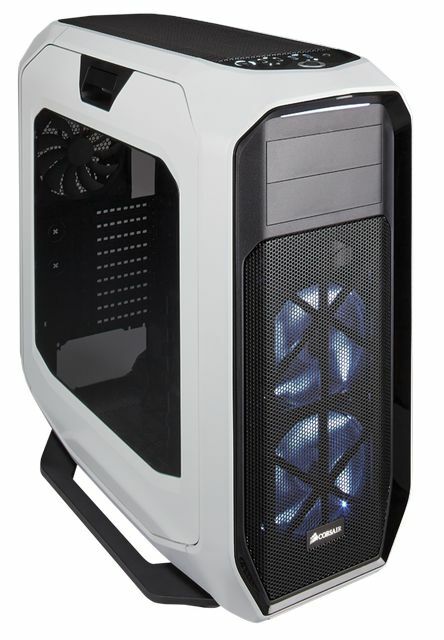 The manufacturer supplies the Graphite 780T in three colors: black, white and yellow. Today, we look at a white variation. Design 780T is interesting, it is a bit like a machine from the space trilogy, and its rounded faces, in turn, greatly reduces the visual size. Each face of the housing are formed in the usual plastic, thanks to the use of plastic inserts manufacturer able to realize such a rounded design. Incidentally, the color differences between the versions lies in changing the color of the plastic part and the side panels. The entire area of the front side is painted in black color reference. Place the panel on top, hiding seats for two 5.25 “devices. Below is a decorative grille and the” rim “of the whole panel is made of glossy plastic. The rear panel is primarily allocated to plug the hole of the motherboard below has nine caps for the expansion slots. Quite interestingly provided with holes for hoses CBO, they have rubber guides and represent nearly one-piece construction with the housing, when they are used will break out. But personally, I did not see any when uses these holes as directed. There is also a seat for one fan, it was originally a pre-installed 140-mm valve from Corsair. Note that it can be replaced by 120-mm version, and will serve as a supplement to the universal ability to adjust ride height. Almost the entire area of the right side panel has a viewing window, probably, it allows you to see all the components installed on the system. The left side is no different to any features, there is little in it, drowning in the direction of the housing, which is strange, but we will soon find out why the manufacturer could do so;). The photos in profile clearly visible small tabs at the top of the body holding them very easy to move the Corsair 780T, however, when moving around the room, they do not seem so reliable. The upper face of the case is made similarly to the front, where there is also a small diamond-shaped form, and a surface covered with black netting. All function keys and connectors Corsair 780T are on the top of that the location of the system unit on the floor will be quite justified and convenient. The main thing that the body is not covered worktop. Here we can see the start button, made in the latest trends in the automotive industry and having a proud name «START / STOP». Along the edges are keys restart and fan control. In addition, the presence of four USB-connector, two for each type, and headphone and microphone jacks. The top panel, or rather its part, the lattice is attached to the body by means of two clips, so removing the panel, it is necessary to carry out a small depression, socket “bounce” up, then easily removed. On the reverse side of the panel has a fabric cover that acts as a dust filter. After removing the decorative panel the user is offered a complete set of holes for mounting a variety of fans, there was a place for: 3×120-mm or 2×140-mm fans. In general, this configuration can be called perfect, and can accommodate most running radiators CBO or the whole “team” of fans. Securing faceplate occurs via the same latches. Under the panel lie two preset fan with white backlight from Corsair. For other fans are provided seats for the following options: 2x 140 mm or 120 mm 3x. On the outer side of the bottom across the length of the hull is located a dust filter, it consists of two parts. Components can be easily dismantled and maintained. Massive leg body can be compared with sledge runners, they have dealt a considerable breadth and length. Their base is covered with a rubberized material that should improve grip and reduce the level of vibration possible. It should be noted that the case is very confident, and even if you try to shake it returns to its original position. The side door as the left and right fixed and open through the mechanism of the type of handle. Initially the “door” is set in the bottom two slots of the frame, then fixed “handle” at the top. Use this mechanism is convenient, we hope he has a good margin of safety. Now, more dense familiarity with the internal structure of Corsair 780T start with the back wall, it is located on the fan already mentioned, this is one 140-mm chaseth air outside. Sweep, plug in the housing and reusable default attached thumbscrews. We can say that a place in the power supply secretive, it is in the lower part of the body and face of the side panel installation is almost at its upper edge, like this PSU and hides out of sight. The unit can be mounted in two positions, a fan upwards or downwards. At the installation sites have special pads to reduce vibrations. The lower part of the body is almost entirely made in the grid on the remaining areas after installing the power supply and baskets for storage may install fans. In the complete set there is room for one 120’ki. The standard design has six slots for 3.5 “drives. But not everyone is so standard, basket design consists of two parts and can be easily upgraded. Let’s look at the basket drives better, as already mentioned they are collapsible. Storage 3.5 “are set using the slide installation is carried out without screws, simply inserted into the drive slots available. Storage Format 2.5” in the case of installation in data skids, attached with screws complete. After removing the baskets for storage, in case it becomes clearly more spacious, but a little more space can be increased.Under the basket is a “pedestal” which aligns with the height of the bottom edge of the window, as it can be removed by unscrewing a few bolts. After complete dismantling baskets available space within the housing becomes properly high. So, we have not yet mentioned the large “viewing window” in the main frame body, it definitely makes it easy to change the cooling system on any motherboard, some manufacturers, it performed a small square, for show, everything is in order. Of course, not every user can completely abandon the drive form factor of 3.5 “, so the manufacturer has provided the ability to mount the basket at the top. This makes it a place for three drives, and freed space in the lower part. Of course, there is another option: leave two baskets, top and bottom, which will establish a very large graphics cards and reduce the number of places for storage. 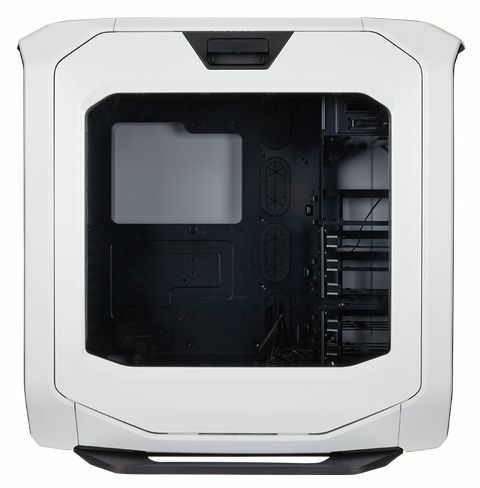 The front panel is as universal as the top, there is space for a 3×120-mm or 2×140-mm fans. It should be borne in mind that when using the radiator CBO dimensions to 360mm, the basket drives must be completely dismantled. But what about installing drives in dismantling all the baskets? Of course, the manufacturer has provided such an opportunity: on the reverse side there are three “runners” for drives form factor 2.5 “, here perfectly fit a couple of fast SSD and one surround HDD. It is a pity, therefore you can not have at least one storage device 3, 5 “, it would be very cool! The back part of the body in addition to fasteners for drives boasts excellent reserves space for it can accommodate the cable even in a state of complete confusion. Reserve space by about three centimeters, but that’s not the most important advantage. At the bottom of the body due to the shape formed a pallet, it is no problem to put all the extra wire power supply.By the way, if you remember about the hard drives of 3.5 “, craftsmen easily able to hide here for a couple, the main thing to take care of cooling;). An added bonus, as part of this material, I decided to install water cooling kit EKWB EK-KIT X240 . Looking ahead to say that soon will be released more detailed material on this bundle. Thus, the collection system was without any nuances. Shopping for storage it has been moved to the top position, which allowed to install the pump and expansion tank near the front. The power supply and heat sink rather plump EK-CoolStream RAD XTX 240 well located in the lower and upper parts of the body, respectively. As we mentioned a campaign of text, the lower part of the body is entirely made in the mesh, this factor can be positively used to secure various components. So in this case, the pump was fixed just to cheer. Quite interesting is the heat sink after installing it seemed small relative to the body, although in many cases similar to his installation is a fairly complex issue. Installed the GTX 960 GAMING 2G, the size of which was not entirely compact, looks just a little relative to the housing.Volume hiding space from the back side 780T, allowed good fit all cable and technological holes could accurately display the desired limit switches. So, in general, would like to mention very good quality handle all facets of the case, the installation is safe and leaves your hands intact :). The assembled system looks very good, of course it is over this assembly still needs to work on, what I’m doing. To sum up on the Corsair Graphite Series 780T, you can call him a great representative of the full-size Full-Tower buildings. Its impressive dimensions and functional forethought will allow to collect really soundly system. 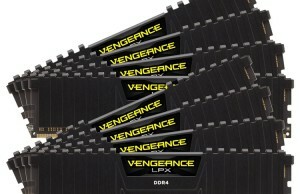 Corsair 780T will allow to organize the cooling systems in various ways, it is a set of seats for fans. Of course, if you do not want to overdo it, the three staff 140’ki perfectly suited to the role of turntables. Using the built-in reobasa, low and even average mode, they remain almost entirely silent. By the way, to the standard reobasu can connect up to five fans, sorry no more. The body can take not only the large-sized air-cooled, and knead in a very decent set of water cooling.